You thought you were making the responsible choice in buying that SUV, but you were tragically wrong. Vehicle rollover accidents, which commonly involve SUV’s without a crucial safety function known as the roll bar, don’t just turn your car upside down; they can turn your whole world upside down. Ford Explorers, Toyota 4 Runners, and Honda Passports are especially prone to rolling over in an accident because they are known to carry this manufacturing defect. If you have experienced serious personal injuries or the death of a loved one because of a rollover accident, you need the counsel of a seasoned lawyer and a whole team of experts committed to being your advocates. The Portland, Maine-based law office of Hardy, Wolf & Downing is the place to come. Our personal injury attorneys can recover the compensation you deserve. 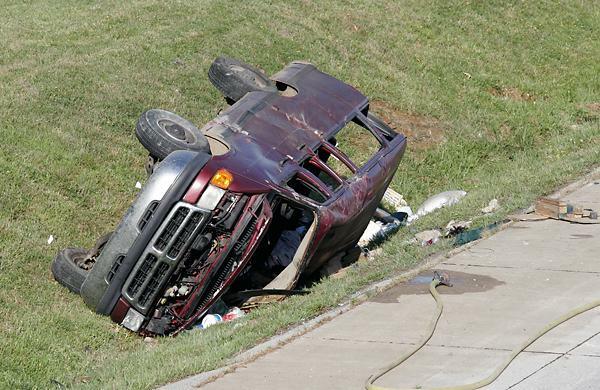 An estimated 70,000 SUV rollovers take place each year, resulting in some 2,000 deaths. In the 10-year period during which Ford-Firestone related rollovers caused some 300 deaths, more than 12,000 people — 40 times as many — died in SUV rollover crashes unrelated to tire failure. A Ford Explorer is 16 times as likely as the typical family car to kill occupants of another vehicle in a crash. 1 out of 4 new vehicles sold in the U.S. is an SUV, making it the most popular type of vehicle in America. The Ford Explorer is the most popular SUV in the world. Historically, SUVs have had the highest rollover involvement rate of any vehicle type in fatal crashes. More than half of all single-vehicle accident fatalities are the result of a rollover. Rollover accidents can occur for different reasons. A driver overcorrects his vehicle. If, for example, a driver tries to avoid an obstruction in the road or oncoming traffic by jerking the steering wheel too forcefully, he/she can send their vehicle dramatically sideways, causing the jeep, van or SUV to flip. A driver veers off the road. This kind of thing can happen when a driver falls asleep at the wheel or becomes distracted. A driver’s tires fail. Tire tread defects, poor stability control, inadequate brakes or a poorly designed suspension system can be a contributing culprit here. A driver hits a “trip.”A “trip” is any obstruction, such as a tree, ditch, guardrail, median or any other type of uneven ground. A motorist is driving an SUV or another top-heavy vehicle. A driver’s vehicle is weighed down. A car with a lot of luggage on its roof is more susceptible to turning over. A driver is aggressively driving or subject to someone else’s aggressive driving. Reckless and/or high-speed driving can bring on a rollover accident. Determining if an automaker can be held liable for a vehicle rollover in Maine is a tricky and delicate matter, which is why only the best car accident lawyer will do. A number of factors require careful consideration in addition to the possibility that your vehicle may be defective. Was driver error at play, and if so, how? What caused the vehicle to go sideways and turn over? What injuries occurred and were they the direct result of the rollover? Answers to such questions will help determine whether you have a legitimate product liability claim to bring forward in the form of a vehicle rollover accident lawsuit. With convenient office locations in Portland, we work with clients throughout Southern and Central Maine including Lewiston, Bangor, and Auburn. A car accident attorney at Hardy Wolf & Downing will sift through the facts of your case to determine whether you can, in fact, hold your vehicle’s manufacturer responsible for the serious injuries you incurred because of a vehicle rollover accident. In doing so, we will want to be able to show that your vehicle’s design directly contributed to your rollover and to the harm you experienced in the accident. We will want to collect all evidence showing that your vehicle was known by its manufacturer to be prone to roll over. To learn more, contact our offices today for your no-charge legal consultation: 1-800-992-7333.